Discussion in 'Downhill & Freeride' started by peecee, Aug 12, 2013. Awesome how the photographer managed to fail to take a pic of the most important part. looks simple n light tho.. Rearward'er too..
No yoke too... Maybe too much CCDBs broken?? BB-pivot, low FSR-pivot, strange rocker/chopped up seat stays. 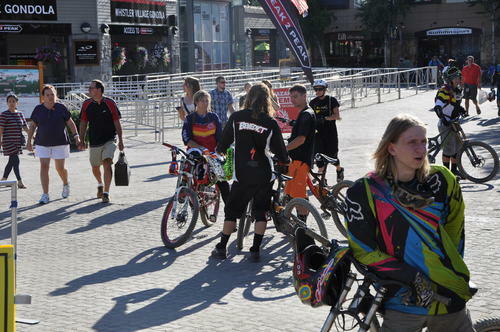 I think there was something on PB about it just being a mule for testing geometry and stuff though, seems strange to take out something you want hidden in whistler right now.. I always thought this was internet fantasy, but then I saw it first hand a couple of weeks ago. well the FSR patent is almost up. benedict was making it hard the whole time trying to cover up the suspension. Kinda hard to cover the suspension while its on the lift. Photographer fail. whoa...if that pivot is really above his ankle and not further forward, it might actually end up doing some pretty cool stuff. Very lawwill-esque. Rode the lift with Benedict on Friday and he certainly was doing his best to keep the pivot locations covered up with his leg/ankle. Didn't get a good look at it. youre gonna name drop like that and not have any pics??? Pretty hard to cover up 11 chainstays with just an ankle. That guy must be pro. Well to really name drop then I should be mentioning the most important one. I was riding with the one and only FlipFantasia. Sorry no pics, I don't keep my phone in a hip holster for quick draw shooting. On the platform he was making sure to keep his foot in front of the pivots. He was kinda being pretty protective of it. Guy didn't say a single word on the lift, nothing, like he was in robot mode. Are my eyes playing tricks on me, or does that look like it pivots around the BB? Seems rather odd to say its just a test mule for geo, wont see production yadda yadda but have a high profile rider at the biggest bike event of the year and the rider has to go all 007 on covering it up. Why? Take some heat of the new super rider's recent fall from a verh high pedestal which is casting a bit of a shadow over the flagship bike's capabilities? Rather cheap marketing ploy either way, slap two ends from existing models, give to a rider for a two week "test session" at the most crowded bike geek event of the year. Even though my overall faith in Spec engineers is quite low, their marketing dept is playing in a different league entirely, but I have to assume the engineers would be interested in making a simpler rear end to make a carbon version of it in a cheaper/easier way. So this is more likely a concept mule of a new Demo backend, cant see much point in geo testing for them any more either. Only thing out of the ordinary on a stock Demo to most other companies is the cs length and their new star rider seem to have spent half his wc season testing that out, so what geo is there left to test? I suppose you missed my post from the last page, but yeah, BB-pivot according to my mate who ran into him as well (and got a good look). so what geo is there left to test? Can confirm the bike on Friday was 650b as it was loaded onto the lift beside a 650b. you may all call me Sherlock from now on. Too bad rotec is not really rotec anymore, or they could play specialized's favorite game- rip off and sue! Also, speciallulz did this when the demo 9 first came out. 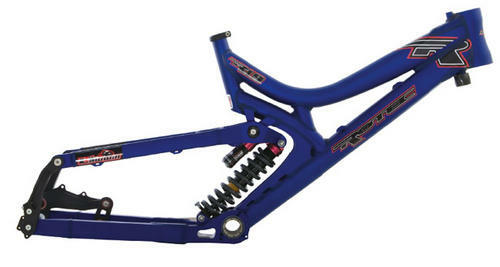 They posted a picture of it with some dude's ankle in front of the linkage and were all like "LOOK AT WHAT WE GOT COMING OUT SOON ITS COOL DUDE" and then they revealed it six months later and everybody was like...wut? Surely if they wanted to keep the proto under wraps, the last place in earth to send it would be Whistler. Clever hype machine IMO . Now now, maybe they just didn't realize that Crankworkz was this week? Also, the branded and named jersey doesn't do much to keep things low key either, does it? are you guys trying to say that a company that sells products is trying to generate talk about, and interest in their products? wtf? "Sorry Leigh, I have to wrap my wiener around my waist to keep it from dragging in the dirt and sometimes it still sneaks out." Forget the bike. The dude in the foreground is rocking the most epic pose I have ever seen. Even Wade there in the background is trying to get a peak. The humongous rocker with the short seatstay (that appears to be almost parallel to it) is pretty interesting. Probably not a production spec but that looks like it would have a gigantic bending moment on the seatstay. Linkage angle to the shock looks like it would be really progressive. nobody wants to talk about the sharpied out fox logo on his jersey?